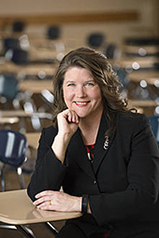 Kelly Sassi is an Associate Professor with a joint appointment in English and education at North Dakota State University, who serves as the Director of the Red River Valley Writing Project. She has published three books about writing on demand. 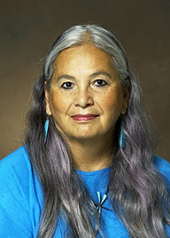 Denise Lajimodiere is a Professor of Practice in the Education Department at North Dakota State University and an enrolled member of the Turtle Mountain Band of Chippewa. She serves on the board of the National Native American Boarding School Healing Coalition Her most recent collection of poems, Thunderbird, was recently published by North Dakota State University Press and includes an original birchbark biting work on the cover. In this article they describe details of an art and writing workshop for teens in the Turtle Mountain Community Schools to express their creativity while developing skills in writing, art, and technology. Four years ago, in fall 2014, Dr. Kelly Sassi piloted an innovative art and writing workshop for Native American students at Circle of Nations School in Wahpeton, ND. The workshop enacted principles of culturally responsive pedagogy by recruiting Native American workshop leaders to serve as role models for the students. Dr. Denise Lajimodiere and Dr. Sassi co-authored an article for Ubiquity on how the design of the workshop indigenized culturally responsive pedagogy. Dr. Lajimodiere suggested taking this workshop to her home reservation in the Turtle Mountains. In the summer of 2015, Dr. Sassi and Dr. Lajimodiere introduced the Teen Art and Writing Workshop at the Turtle Mountain Middle School in Belcourt, ND. Since then, this workshop has become an annual event and the students look forward to it all year. The workshop is sponsored by the Red River Valley Writing Project at North Dakota State University (NDSU), the Alliance for Young Artists and Writers, and Turtle Mountain Community Schools. The goal of the workshop is to provide opportunities for teens to express their creativity while developing skills in writing, art, and technology. Development of a personal voice and vision is a priority of the organizers. This workshop is unique in that it draws primarily from a pool of talented Native American artists and writers who both share their craft and serve as inspirational role models for young people. Dr. Sassi and Dr. Lajimodiere created this workshop as an intervention program to address education inequity. They drew upon the ideas of culturally relevant (Irvine, 1992), culturally responsive (Gay, 2000), and culturally sustaining (Paris, 2012), teaching approaches and designed this workshop in response to empirical evidence that identifies creativity in writing as a student strength (Sassi & Lajimodiere, 2016). The workshop built on the cultural strengths of Native American writers and artists to provide opportunities for students to develop their own styles of creative expression. 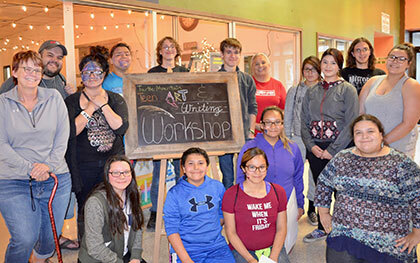 This year, Dr. Sassi and Dr. Lajimodiere partnered with Turtle Mountain Middle School to host the third annual Turtle Mountain Teen Art and Writing Workshop for 20 students in grades 7-12 from June 26-29th. The 2017 workshop leaders included Denise Lajimodiere, Lise Erdrich, Laura Youngbird, Anthony LaFromboise, Sadie Frederick, Marlin Allery, Frankie Jo Morin, Caitlin Johnson, Anthony Albright, Shweta Sharma, Dave Binkard, Kelly Sassi, and National Student Poet, Weston Clark. The 5-day workshop consisted of several mini-workshops, including video game design, journalism, birchbark scroll writing, digital art, poetry, dramatic script, cartooning, and songwriting. In addition, students started each day with a writing prompt and shared their writing in small and large groups. A new feature this year, was extending the video game design option by a week. 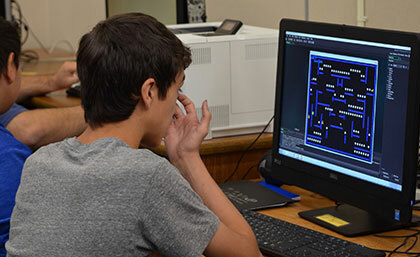 Eight students started with video game design a week earlier than the main workshop. This gave them more time for coding and developing original characters and storylines. Dave Binkard of PODS Game Design led the workshop, and Tony Albright and West Clark helped students finish their games. Day 1 included introductions and warm-up at Generation Art inside Jollie’s Mall in Belcourt. Generation Art is a community space developed by Tami Jolie-Trottier as one of her Bush Foundation Projects. Dr. Lajimodiere shared her story of learning that someone from her tribe (Louise Erdrich) had published, which was an award-winning book. Dr. Lajimodiere then went on to tell about taking a writing workshop from Louise, and beginning to see herself as a writer. She started sending her work out for review, eventually publishing several poems and even chapbooks of poetry. Dr. Sassi then invited the students to engage in a pair storytelling activity, designed by 2014 National Student Poet Weston Clark, about an influential moment. Students told each other’s stories as a way of introducing each other. Their stories were inspirational, heart-breaking, and honest. Students talked about their dreams for the future—to become a doctor or a lawyer, for example, or to make changes in their community. Next, Dr. Sassi invited students to interpret a quote from British poet Percy Bysshe Shelley, “Poets are the unacknowledged legislators of the world.” Students had much to say about this quote and Dr. Sassi asked them to think about what laws they might change through their own writing. Students then did a jigsaw reading of excerpts from boarding school narratives as preparation for their trip to Fort Totten. Dr. Sassi and Dr. Lajimodiere invited students to think about how learning about the site might inspire their own writing, whether it be writing to heal, to reflect, or even to ignite change. Day 2 started with a writing prompt by Anthony Albright and birchbark scroll writing by Laura Youngbird and Lise Erdrich. Laura and Lise were joined by their teacher, Anthony LaFromboise, who created the birchbark scroll that tells the story of the Skydancer. The original scroll is in the Skydancer Casino, which is named for the main character in this story. There were parallel workshops on poetry by Dr. Lajimodiere and video game design by Anthony Albright and Weston Clark. After lunch, Anthony Albright and Shweta Sharma led the students through a fish bowl activity to demonstrate how to provide substantive feedback on each other’s writing. Students who had been through the workshop in past summers served as peer leaders for their workshop groups. Next, students opted to work on journalism or video games. Shweta conducted a yoga session for a brain break and talked about the importance of focusing on breath. Students then workshopped their writing and video games. Generation Art generously provided their space as a venue for individual work time in the evening. Day 3 started with a writing prompt from Dr. Lajimodiere and followed the sequence of Day 2 in terms of birchbark scroll writing. There were parallel workshops for dramatic script writing and video game design. After lunch, all students travelled to Fort Totten Boarding School for the tour and the grief writing workshop. This year, students took a field trip to Fort Totten State Historic Site. Fort Totten served as an American Indian Boarding School from 1891-1935, and was attended by Dakota students from Spirit Lake reservation, as well as Ojibwe, Cree and Metis students from Turtle Mountain reservation. The purpose of the field trip was to explore the boarding school history of the site, listen to elders who attended boarding school, write about the space, share their impressions, and learn from Dr. Lajimodiere, who is a member of the National Native American Boarding School Healing Coalition and conducts research on boarding school survivors and the effects of boarding school experiences on education today. 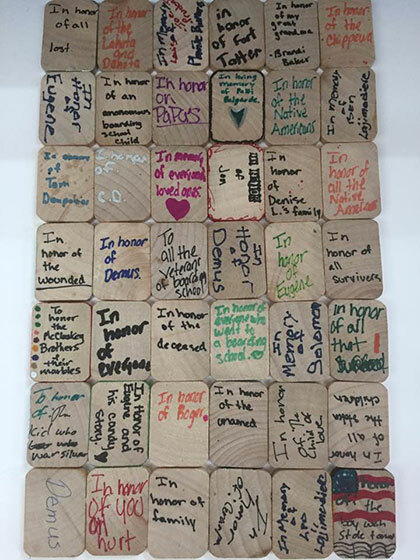 With the support of a tribal grief counselor, students used writing as a healing strategy and also created “Healing Tiles” to honor the memory of a boarding school student, whether he or she was a member of the student’s own family, an elder they met, a student they read about, or one they heard about from the state historic site guides. Day 4 started with the morning writing prompt by Weston Clark, followed by parallel workshops on birchbark scroll writing and songwriting. After lunch, students continued to work on dramatic script and video game design. After enjoying an outdoor brain break with Weston Clark and Anthony Albright, the students worked on digital art with Marlin Allery, who teaches graphic design at Turtle Mountain Tribal College. Once again, Generation Art offered the venue for individual work in the evening. Day 5 started with the morning writing prompt by Dr. Sassi. On this day, Weston conducted an ancestors and memory writing workshop. After lunch, students worked on cartooning with Frankie Jo. After a brain break with Anthony Albright, students got busy rehearsing for the Student Showcase. Students focused on polishing their work for the Student Showcase, hosted at 6:30 p.m. on Thursday, June 29th, at Turtle Mountain Community College. The showcase was organized by Anthony Albright, who holds a M.A. in Theatre Arts from University of North Dakota, and Erik Kornkven, an NDSU alumnus who currently serves as chair of the English department at the College. About 70 Turtle Mountain community members attended the showcase, All of the student participants presented at the showcase. The showcase started with an artwork exhibition followed by a performance of Hotel California. Dr. Lajimodiere introduced all the students. Seven students presented their work in the Student Art/ Video Game Presentations, 9 students presented in Student Writing Presentations, and 5 students presented in Student Fiction/ Play Presenations. The work presented at the showcase beautifully depicted student experiences. Similarly, another student participant, Tiffany expressed her experiences as a Native American in a beautiful poem titled, Who I Am. I am from pure white La gallette and golden fry bread. I come from a big pot of bullets and bangs. From fierce storms, that makes your cheeks cherry red. From a big, steep hill covered in ice. I am from many scary tales. about rougarous, chupacabra's and the ghosts of Wales. I live by story telling around a fire. that my people grew up on. It's where there have been many deaths. Where my home land has been taken. We lost our precious culture. We stopped speaking our Native language. We were forced to stop hunting. We had to follow their rules. They sent us to boarding schools. They thought we were wild. us. They wanted us to be mild. We were called a beast. They bartered us with the French. Our full blood count had decreased. We were forced to live on reservations. we didn't tell our story. they put our skin color into a category. They get us confused with the Crow and Blackfeet. We were recognized by our floral moccasins. Did you find out where I'm from now? Doonji Siipiising Mickinoc Wajiiw Ishgonigan. 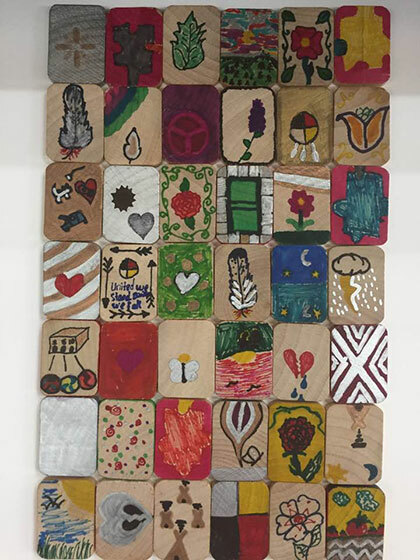 Students also presented “Healing Tiles” from their visit to Fort Totten Historical Site and the subsequent Grief Writing Workshop. 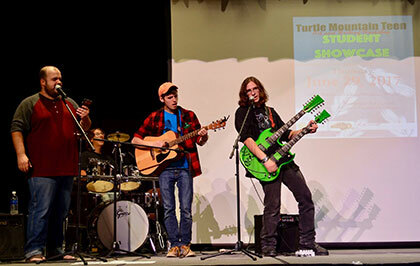 Last year, Turtle Mountain students traveled to NDSU for a fall reunion to continue their writing, create accounts at the Scholastic Art & Writing Awards website, tour NDSU, and reconnect with Weston Clark. The Red River Valley Writing Project would like to hold another reunion this fall; however, due to North Dakota State Legislative budget cuts, the project’s funding was cut substantially. So, the reunion may not be possible this year. Nevertheless, the enrichment of the summer program lives on, as classroom teachers report that students who participate in the summer workshop do better in classroom writing than their peers and also perform better on tests. Gay, G. (2000). Culturally responsive teaching: Theory, research, and practice. Multicultural Education Series. New York: Teachers College Press. Irvine, J. J. (1992). Making teacher education culturally responsive. In M. E. Dilworth (Ed. ), Diversity in teacher education: New expectations (pp. 79-92). San Francisco: Jossey Bass. Paris, D. (2012). Culturally sustaining pedagogy: A needed change in stance, terminology, and practice. Educational Researcher, 41(3), 93-87. Sassi, K., & Lajimodiere, D. (2016). Native American adaptations of culturally relevant and responsive pedagogy in an art and writing workshop at a Native American school. Ubiquity, 3(1), 111-134.